New York Islanders defenseman Jack Hillen will miss six to eight weeks with a broken jaw and damaged teeth caused by a slap shot from Washington Capitals star Alex Ovechkin. The Islanders said on Wednesday that the 24-year-old Hillen remained hospitalized following surgery late Tuesday night into the morning. Hillen was injured in the first period of New York’s 7-2 home loss on Tuesday and is expected to be discharged from the hospital on Thursday. It is the second major injury to the Islanders’ defense corps that lost veteran Radek Martinek to a season-ending knee injury in November. Hillen was helping to protect the net when he was struck in the face by the puck. It is just one of those freak accidents that happen in hockey. 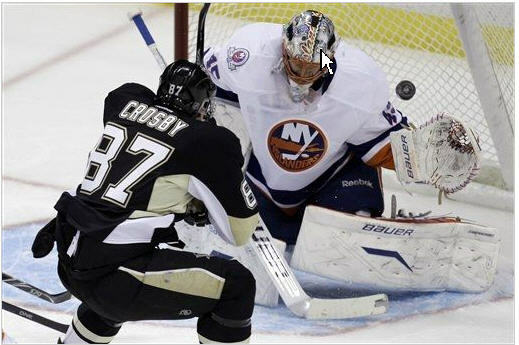 The Islanders have a record of 23-22-8 for the season and are in the midst of a wild tussle for the last 3 Eastern Conference playoff berths. The loss of Hillen probably won’t affect the team too adversely. As long as no other major injuries happen. Phoenix Coyotes defenseman Ed Jovanovski has been suspended two games by the NHL for an elbow hit to the head of New York Islanders rookie John Tavares. The suspension, announced Monday, is Jovanovski’s second of the season. He was also penalized two games on Dec. 9. Jovanovski hit Tavares with 17 seconds left in the first period of the Coyotes’ 5-4 shootout loss on Saturday night, and was assessed a major for elbowing and a game misconduct. No question in my mind about the hit being intentional. Hits to the head can be dangerous, and that’s why players like Jovanovski are suspended for them. 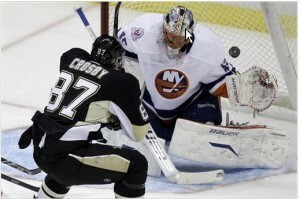 He deserves the penalty handed down to him for his hit on John Tavares. The Philadelphia Flyers replaced coach John Stevens with Peter Laviolette on Friday after the team was shut out in consecutive games. Laviolette led the Carolina Hurricanes to their only Stanley Cup title in 2006. He was fired in December 2008 and was still under contract. Laviolette, who also coached the New York Islanders for two seasons, was 167-130-30 in his four-plus seasons with Carolina. The Flyers were expected to contend in the Eastern Conference this season. They were 13-11-1 for 27 points and out of the playoff picture entering Saturday’s game against Washington. Philadelphia stands a better than a 50% chance of making the playoffs, but they aren’t better than the fifth or sixth best team in the Eastern Conference. Washington, Pittsburgh, New Jersey, and Boston at least are clearly better than the Flyers. Flyers General Manager Paul Holmgren said he lost confidence in Stevens. Two shutouts in a row is grounds for firing. How long before Philadelphia’s ownership loses confidence in Holmgren? Would you believe 62 shots on goal? It’s been 18 years since a goalie had a night like Islanders netminder Dwayne Roloson. 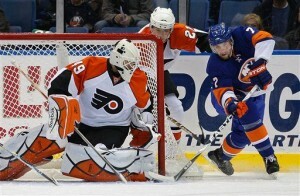 Roloson turned aside 58 shots to help the New York Islanders beat the Toronto Maple Leafs 4-3 in overtime on Monday night. It was the most saves since Ron Tugnutt stopped 70 shots for Quebec on March 21, 1991 according to STATS. The victory improved Roloson’s record to 2-0-2 on the lengthy trip, and 7-2-5 overall this season. The Islanders went 3-2-2 on the seven-game trip to improve to 9-8-7 in 2009-10, but they know they wouldn’t have been so successful if not for the tireless Roloson in net. Roloson, who signed as an unrestricted free agent last summer, made several great saves — the most painful of which was No. 52, a hard shot from Mikhail Grabovski that hit him directly in the mask. It’s the kind of performance his new team has come to expect. Craig Anderson, while still playing for the Florida Panthers, turned back 51 Islander shots in a 2007-08 NHL game. Anaheim Duck Goalie Jonas Hiller stopped the same amount of shots in a game last December. Only Anderson got a shutout. Oft-injured New York Islanders defenseman Radek Martinek is out for the season with a knee injury. The 33-year-old Martinek tore the anterior cruciate ligament in his right knee on Friday night in the third period of a 2-1 loss at New Jersey, the Islanders said on Saturday. Martinek was helped off the ice with about 5:45 to play after he was hit hard against the boards in front of the Devils bench by Zach Parise. The Islanders are thin at defenseman but a team relying on a player at Martinak should have a backup plan in mind. Radek Martinek’s greatest consistency as a player is his ability to get injured.